Safe and efficient sack lifters for ergonomic and economic working conditions. 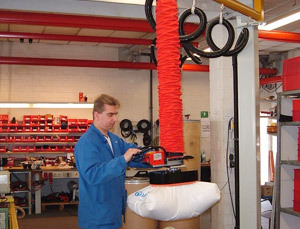 Vacuum sack lifter makes lifting simpler and safer with higher efficiency and reliability. Measures to relieve the physical burden - and therefore protect your workers are incestments which make ergonomic sense and, in medical terms, are often simply necessary.